What can I learn from difficulty? What’s one step I will take today? Right questions at the right time are powerful catalysts for change—and we all need these reminders to be the best we can be. 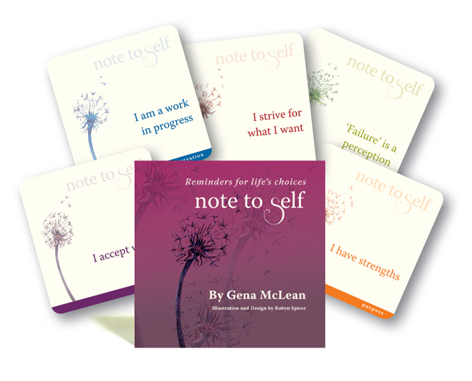 Drawing on the wisdom of Choice Theory, Note to Self is a set of 24 cards designed to promote self-responsibility. They are reminders which can help us gain effective control over ourselves and our lives by focusing on that which we have direct control over: our thoughts and actions. Note to Self is divided into six suits: Power, Perspective, Potential, Purpose, Preservation and Practice. Each suit offers four statements and a set of questions to help us focus on the choices we can make. Featuring muted colours and the subtle motif of a dandelion, Note for Self provides simple but profound affirmations and, importantly, asks us to identify how we will action these affirmations in our daily lives. This resource can be used in a variety of ways with groups and individuals, and is ideal for counsellors and therapists, life coaches, psychologists, social workers, managers and supervisors, teachers and trainers, facilitators and team leaders, and Choice Theory practitioners. Polypropylene box and 30-page booklet. ‘My role is varied but I do a lot of one-on-one counselling with students, which can take a variety of forms depending on the student. I believe that reflection is a powerful tool and the primary focus of my counselling is using a strength-based approach. I recently used the cards with a Year 12 student, who was reflecting on her upbringing and her parents’ influence. She was worried about the person she would turn out to be, and what her future held in terms of education, employment, family, relationships, etc. I put the Note to Self cards out and asked her to pick any that drew her eye. She picked out 10 cards which I was surprised at, and I wasn’t sure how successful the exercise would be given the number of cards. But it worked out really well. I asked her to pick one of those cards that stuck out the most. It just happened to be the same card I would’ve picked out for her, given her thoughts when she came in. 1. I stick a different Note to Self card up in the staff toilets each week. The toilet, for a teacher, is sometimes the only place you get to sit for the whole day. The teachers really love having something to reflect on before going back into the craziness of the classrooms. 2. The other way I use the Note to Self cards is to read them to myself and think about who might need a particular card. I pass it to the person to reflect on for a day or a week (however long they think they need it), then they pass it on to someone else. By the end of the term I have most of the set of cards out and about around the school. Sometimes they make it to parents and sometimes they become prompts for a class discussion.